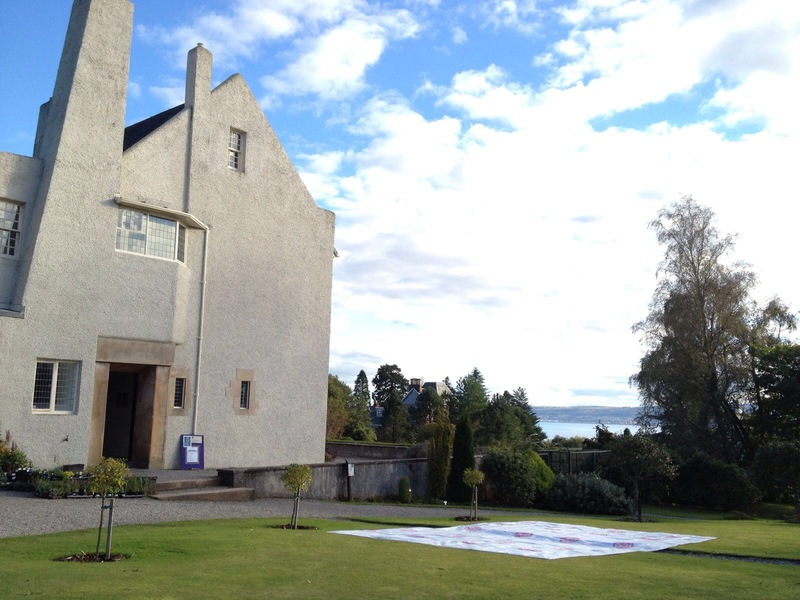 This morning, 24 beautiful ordered large cabbage roses are adorning the lawn in front of The Hill House in Helensburgh, that Charles Rennie Mackintosh designed for the publisher Blackie in the early 1900’s, a pure Scottish Art Nouveau Gem ! 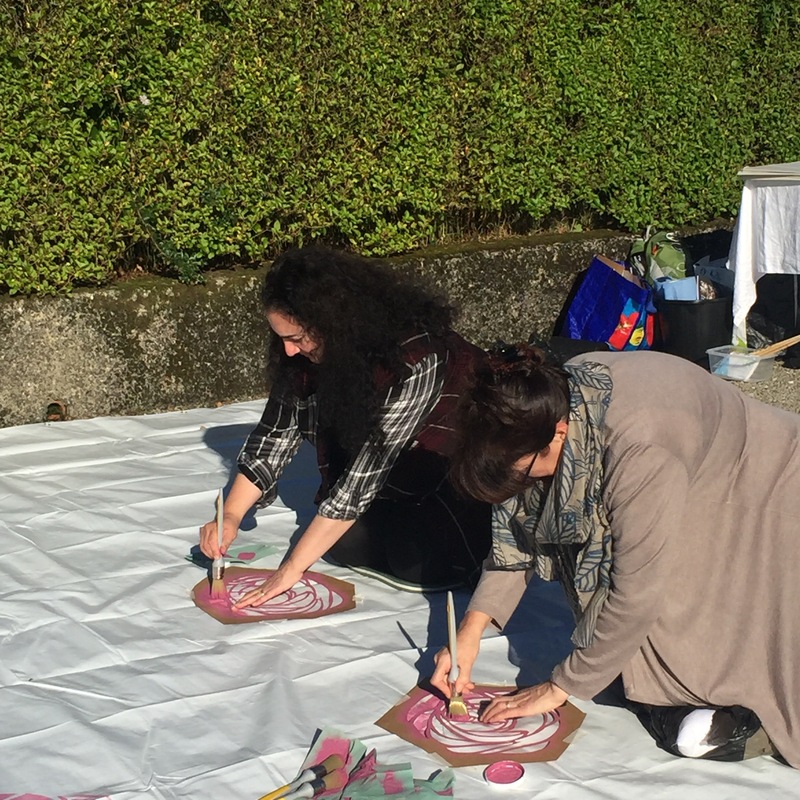 They are the result of the first day of #thebigroseproject , an art project I am running this October in connection with the #MackintoshFestival this year. 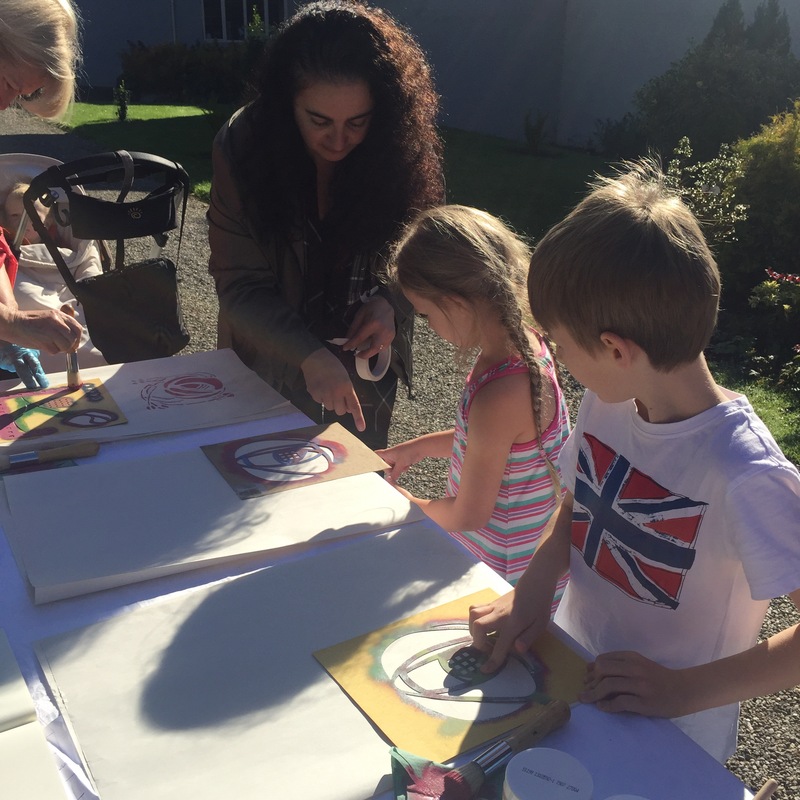 We have 5 #Bigroseproject day and 1 Stencilling Masterclass during the month of October. 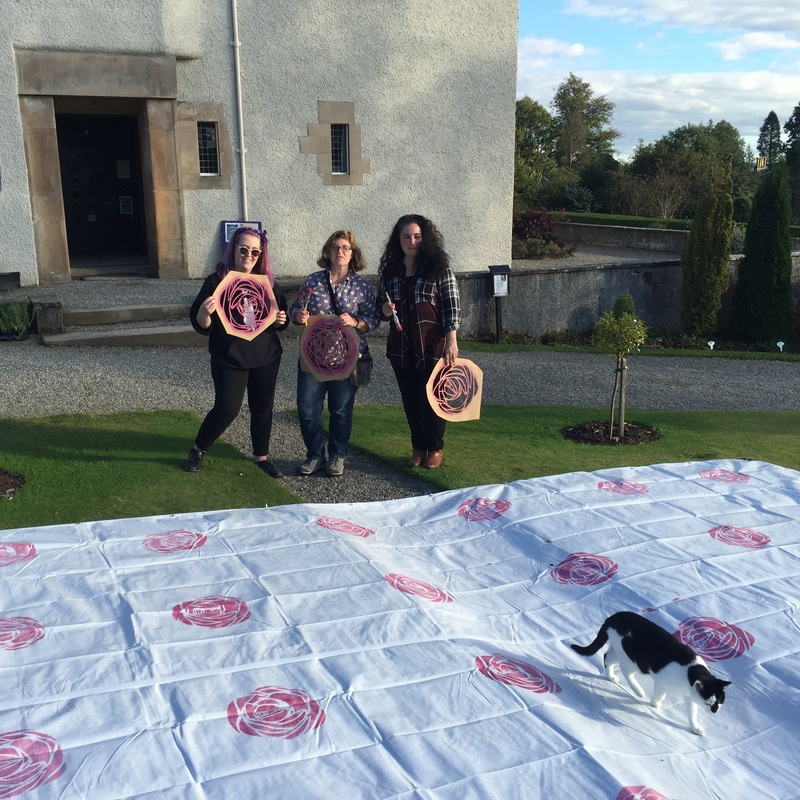 The idea is to welcome the public to the Mackintosh venues this autumn during the festival with a carpet made of roses designed by the great master over 100 years ago. 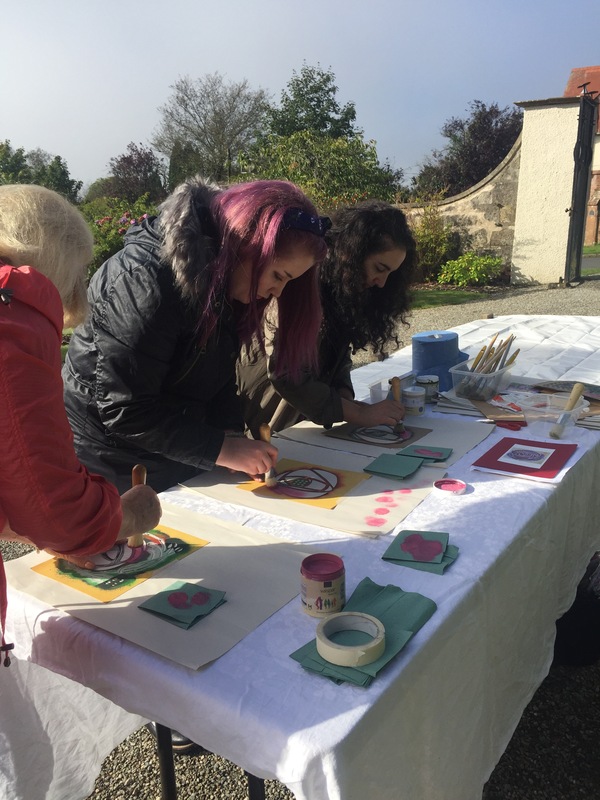 The rose we used here comes from #thewillowtearooms but was used for the stencilling of the fire place of the 1990’s creation of #thehouseforanartlover in Glasgow. 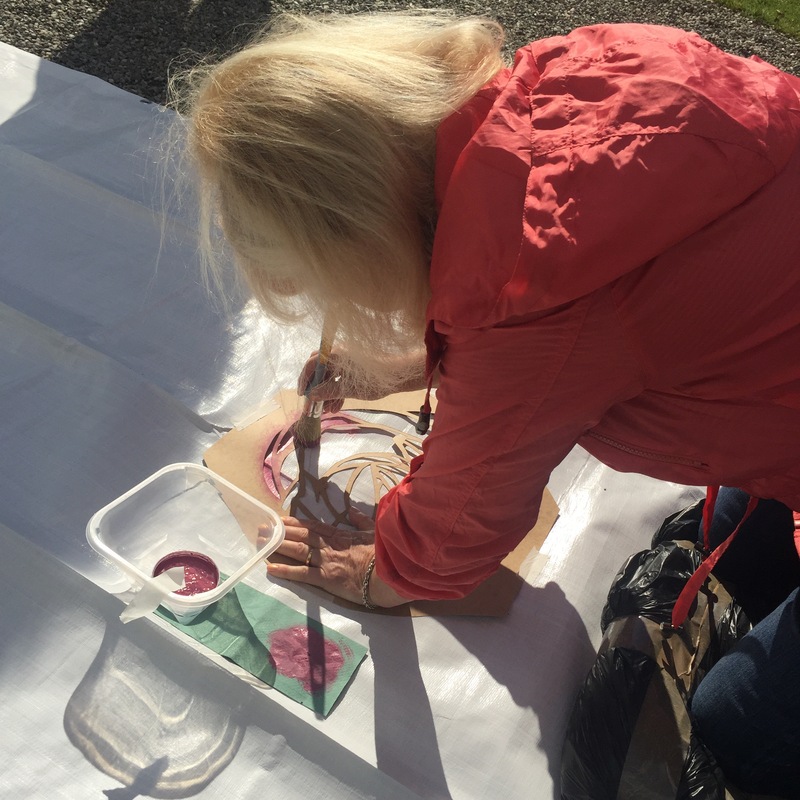 Its a grand project, a year in the making, and many people involved in the preparation but today is a special day as for the first time the beautiful rose gets stencilled again and this time by the visitors themselves. 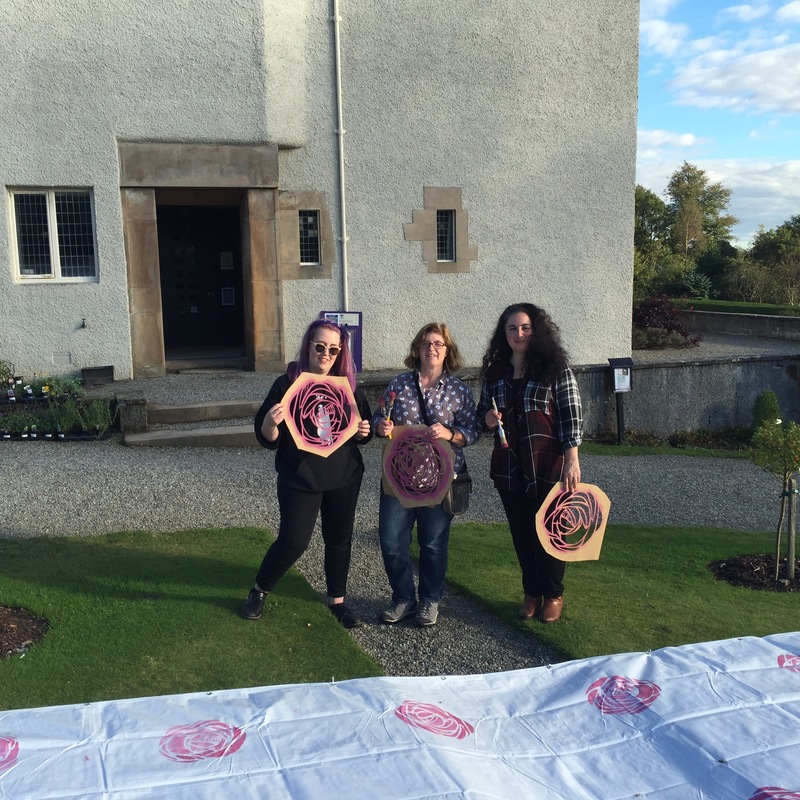 To help me making sure they enjoy this #theGlasgowrosegirls my wee volunteers Rachel and Sula are giving them a full stencilling practise making sure they get the grip of their stencilling brush before they are given a cushion and down on the ground they get to stencilled their large cabbage rose. Volunteers are a great thing, I was once told by Creative Scotland that one should not expect to “exploit” people with the mere promise of an entry on one’s CV. I am not sure he understood the process… When looking at the interaction I have with my volunteers on this project I think he might have failed to understand the whole “exchange” concept of volunteering. 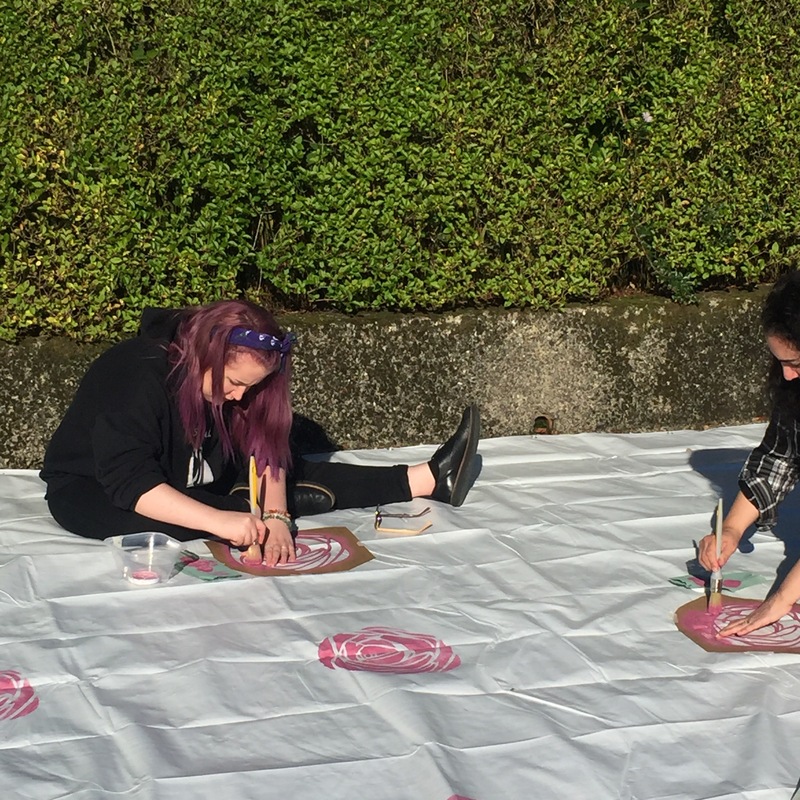 In this project I get 6 very keen “arty” young girls who want to involve themselves in an art project without having to drive it. They are gifted, enthusiastic, full of energy and ready to engage for the day. They have real skills they are prepared to share but they also want to learn in the process and meet other likeminded folks. And that I can offer them… in return they make sure I don’t turn into a nervous reck that all the visitors feel important and looked after. 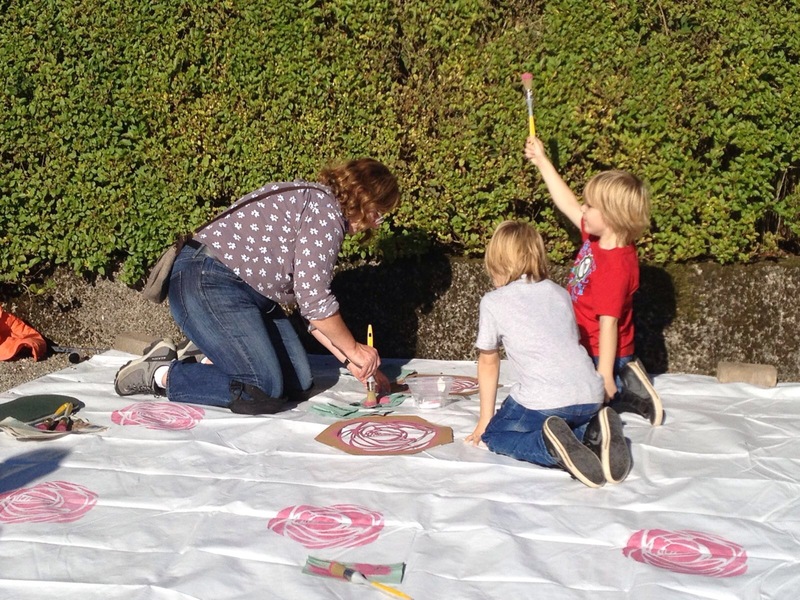 They tried their hand at stencilling, they even stencilled a few roses themselves. 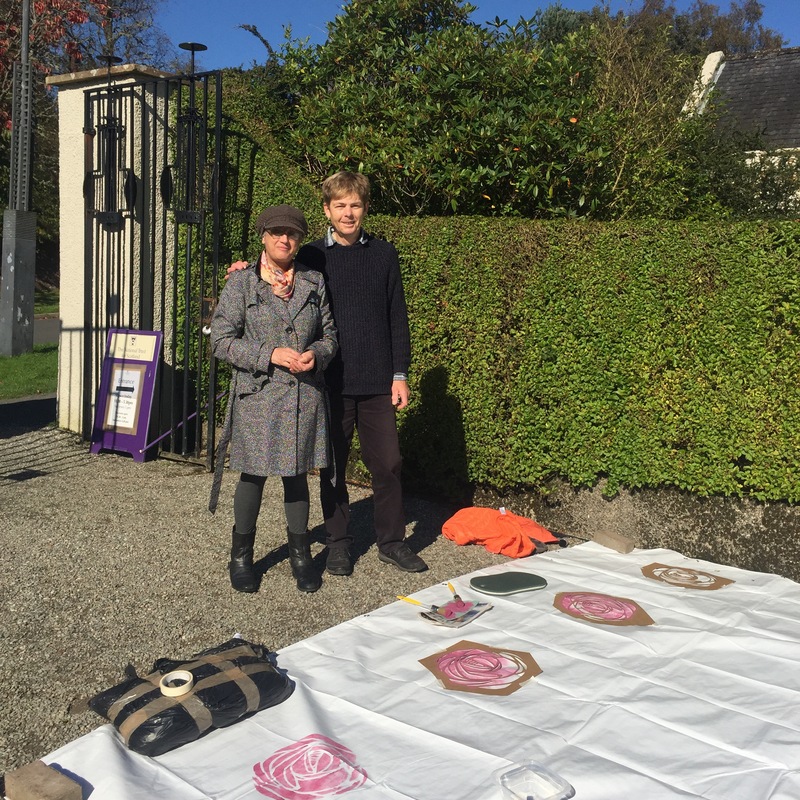 They drank tea, stood in the beautiful sunny garden for the day and met a good number of great visitors and gave me advice. We exchanged, we were this short lived team. It was a beautiful exchange. They were so joyful, they made a huge difference to the success of the project. And then after much preparation I made my way to The Hill House. 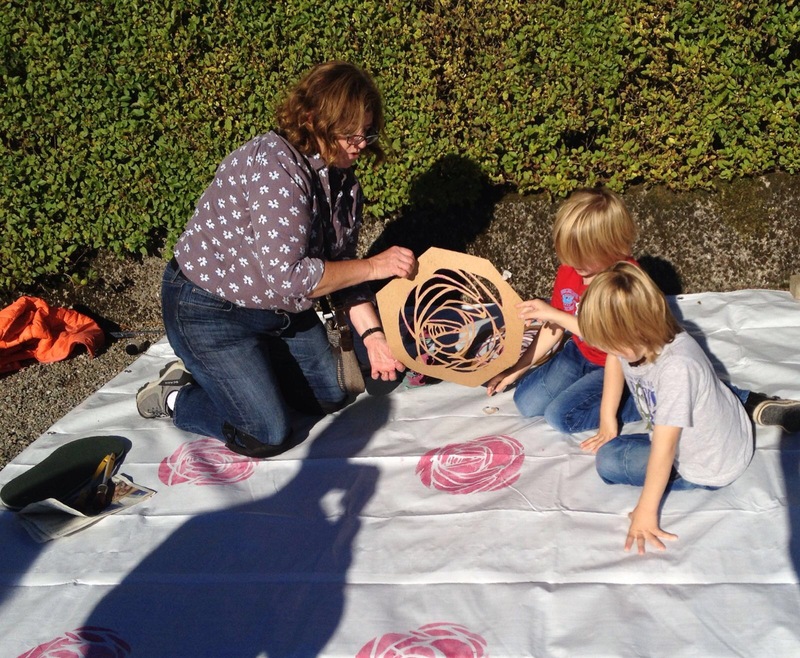 In the stunning garden we ran the first day of #thebigrose project. 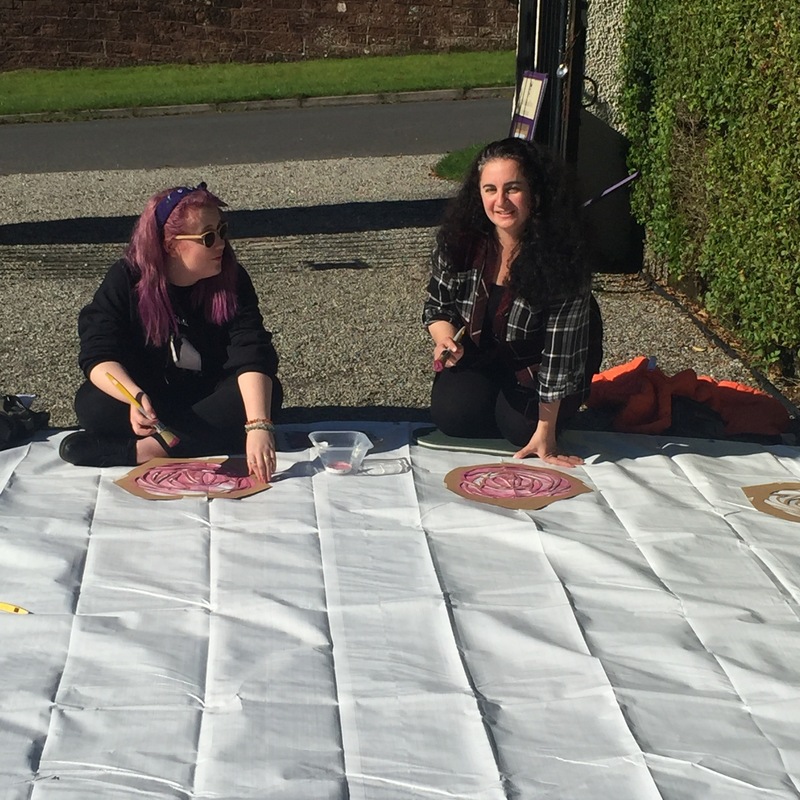 We arrived with a car full of stencils, brushes and paint, two volunteers and myself, that would be us “The Glasgow Rose Girls” and we set up a large piece of tarpaulin in the garden path. 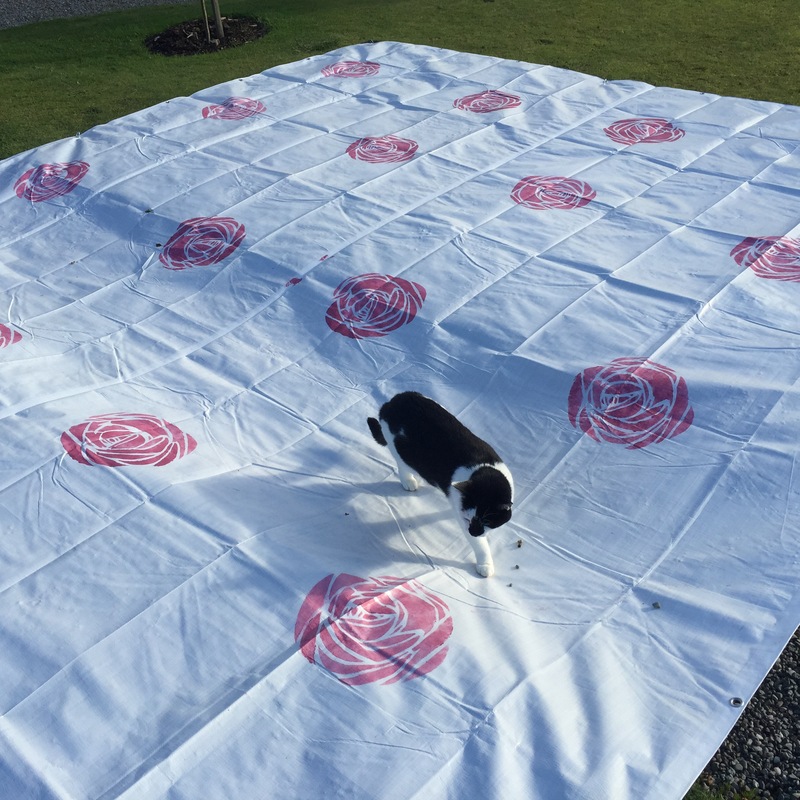 On it we would stencil during the day a good number of Charles Rennie Mackintosh designed roses. The Plan… make a carpet. 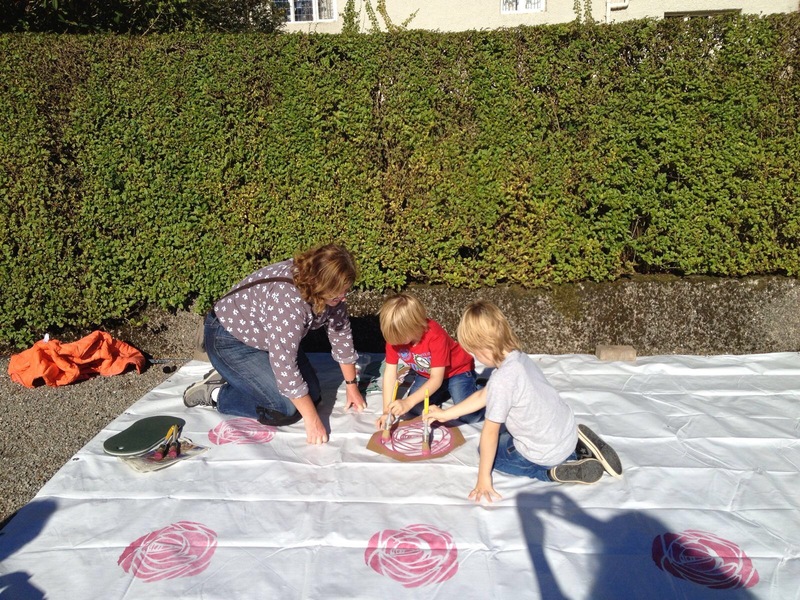 Get the public to stencil those roses onto the Tarpaulin, getting them to remember the feel of hand-made Arts and Crafts. 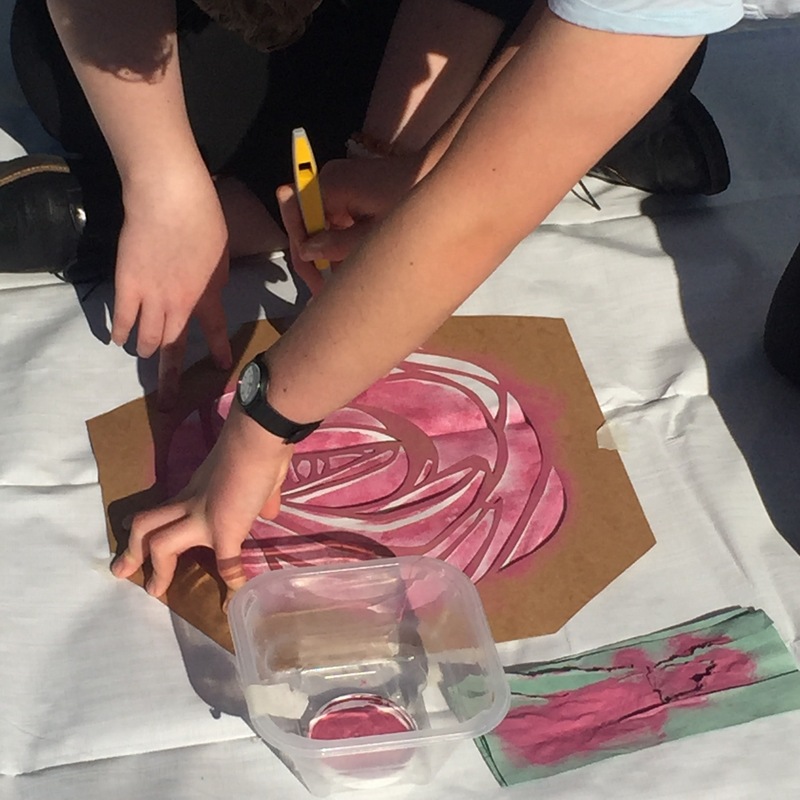 Getting them to look at some really good Mackintosh design and switch off for a few minutes from normal life to become an artist even for a few minutes. Karen the retail manager at the property had a good go at it, she is an artist herself and produces those wonderful silk painted scarves. 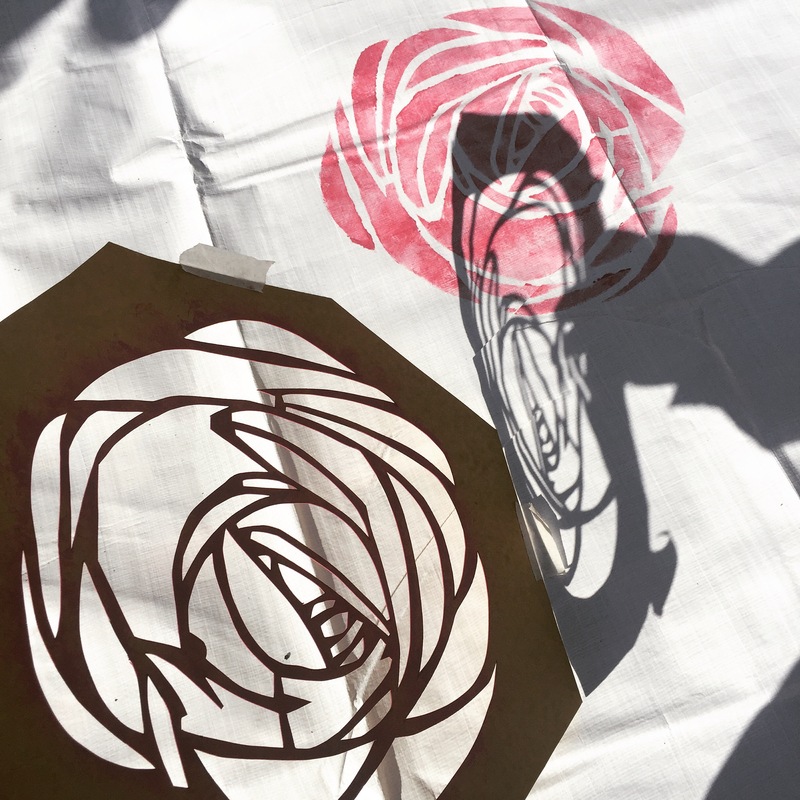 She came down from her office, and … stencilled a rose. The best stencillers by far were the children, completely fearless they were arriving with their mums and dad (and sometimes powerless little brothers or sisters in the pram) and got to work, no fear about making a mess like any adult would think… just down to business eager to hold the brush and make an early start. 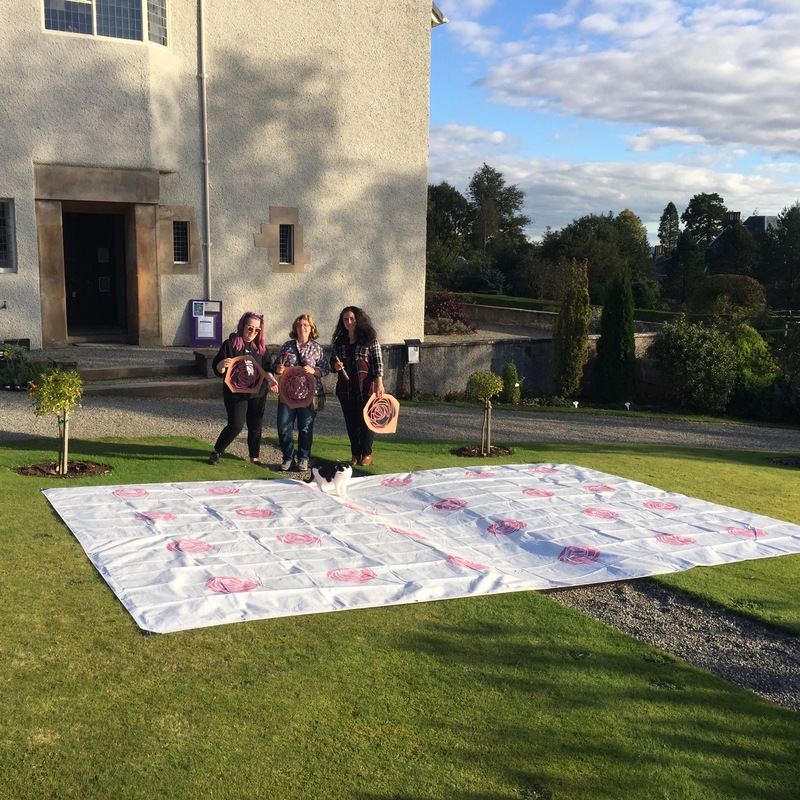 We even had…. The Local Cat ! The result is stunning and after a second quick visit this week to check the paint and add the leaves I expect it will be there until the end of October a moving carpet which will tour around the garden to avoid yellowing the grass… Gavin the gardener offered to move it around for me. Thats a new job for a gardener… Moving the roses around without getting his hands dirty ! 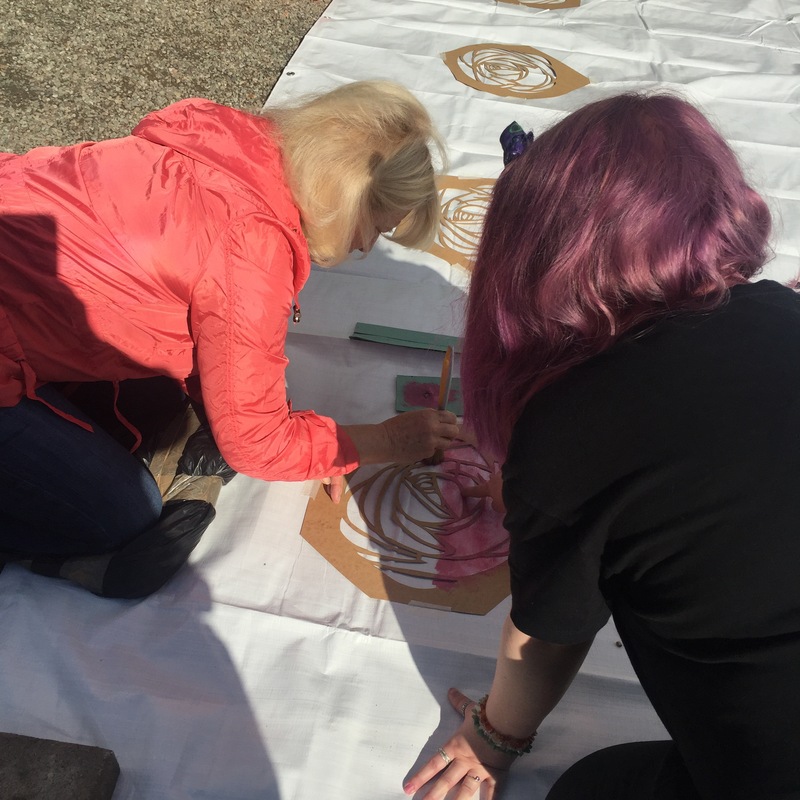 I am looking forward to next Sunday, We will be at Queens Cross Church stencilling on the pavement this time on the 9th of October. I hope to see you there! Previous Previous post: #thebigrose update ! One week to go !!!! 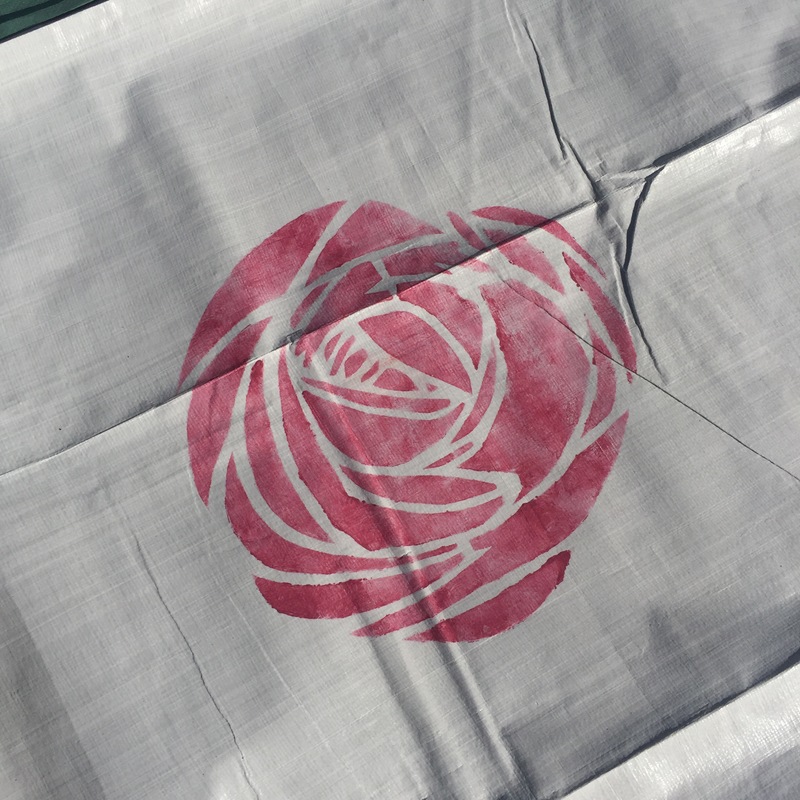 Next Next post: 24 #Big roses at The Mackintosh Church A Pure Dead Brilliant experience !